Our inverse biology microscope XDS-2 FL is developed for ambitious applications in the fluorescence analysis. The inverse biology microscope also assures by the bright field and phase contrast method. 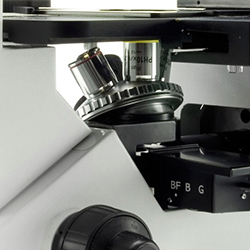 In application the microscope is very user-friendly. 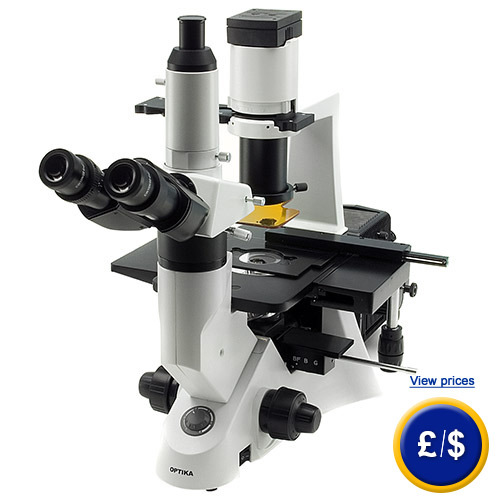 The diopter can be adjusted to your need, so that the inverse biology microscope opens the best view. Your microscope is very comfortable for your head form, also for wearer of glasses, because you can adjust the eye distance individual. Furthermore you can change the metallic element for your inverse biology microscope for object plate, petri dishes or for bottles too. If there are any questions about this inverse biology microscope, please have a look at the technical specification below or call: UK customers +44(0) 23 809 870 30 / US customers +1-410-387-7703.. Our engineers and technicians will gladly advise you regarding the inverse biology microscope or any other products in terms of regulation and control, or scales and balances of PCE Instruments. 48 - 75 mm. Adjustable dioptric compensation. Long working distance (LWD) infinity corrected (IOS) planachromatic: 4x/0.10 (working distance 18 mm), 10x/0.25 with phase ring (working distance 10 mm), 20x/0.40 with phase ring (working distance 5.1 mm), 40x/0.60 (working distance 2.6 mm). Size: 250 x 230 mm. Translator with lowered ergonomic coaxial controls. X-Y translation: 119 x 70 mm. Interchangeable metallic inserts for specimen slides, Petri dishes and flasks.